Rupert Murdoch, chairman and CEO of News Corp.
Media giant Rupert Murdoch wishes to invest in the Amazon Kindle – or rather, a Kindle competitor. At this point in time, there is no detailed business plan, or even confirmation that this new e-reader will use the same E-Ink technology as Kindle. There was mention, however, that this Kindle competitor would boast color, unlike its current monochrome counterparts. And with enhanced features such as an enlarged screen, this fabled e-reader certainly sounds like a tantalizing alternative to struggling print newspapers and magazines. 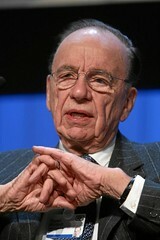 For those curious about who Rupert Murdoch is, Murdoch is the chairman and CEO of News Corp, a media giant that owns media outlets such as FOX News, MySpace and The Wall Street Journal, to name a few. According to the Globe article, the newspaper e-reader model might be seen next year. As history goes, economic downturns tend to reinvent the wheel – which in this case, is print. Since life is always healthily peppered with irony, future print journalism may no longer be printed in the sense that it is now. Should e-readers steer the market, the newspaper delivery boy will be out of business, but journalists may see their work published in a money-making format again. Although it still stands to wonder exactly how this Kindle-esque business plan will help print journalism, since information has a habit of appearing free online. After all, it didn’t cost a dime to search for this headline and link to the Globe, of all troubled places. Perhaps the Internet may experience some sort of media moderation in the future, where search engines such as Google and Yahoo! can’t as easily peruse headlines and pluck the ripest fruit for search results. It’s a good question, and this blog is guilty as charged. Photo credits go to World Economic Forum of Flickr. Newspapers: a reliable commuter companion. When thinking of the last and only place where newspapers or magazines thrive, the first image to pop into mind was the subway. Trains, metros, tubes, lines. There are plenty of nicknames for underground trains in the United States, but the lot of them have this in common: they disappear underground for long lengths of time. During the morning commute, the free newspaper bins are always stocked to full and then ravaged by every hurried passerby. The free morning newspapers are the perfect commuting companion: they’re free, easily accessible and short. Perfect for the train commute into work. But another convenience is the fact that these free newspapers don’t suffer while underground – you see, there’s no Internet connection to maintain. While even some of the most advanced technologies may lose Internet connection in the deepest New York subways, an old-fashioned newspaper keeps its words on every page without a flicker or blink. Unless, of course, someone spills their morning coffee and soaks their copy from back to front – then the reading experience is ruined, along with your expensive slacks. Regardless, even 3G marvels such as the iPhone and Amazon Kindle haven’t penetrated every subway tunnel and crevice. These underground oasises may be the last newspaper haven before the medium reaches its next stage of evolution. Photo credits to Erich Ferdinand on Flickr. Recently, the phrase “magic bullet” pops up when journalists discuss the industry’s next business plan. The story has been told again and again: print is not the ad-selling, cost-efficient, information-spreading medium it used to be, but online distribution does not fill in the money gap. In short, news consumers have grown used to information being free, but news providers can’t provide this free service and still put bread on the family table. So perhaps it’s natural that the phrase “magic bullet” has come up. This refers to a quick cure that ends all ills without a catch. Truth be told, a magical cure-all for anything would be wonderful – but as reality goes, that is rarely the case. Therefore, in a plane of existence where journeys are complex and take many loops and nauseating turns before the finish line, let’s look and see at some of the progress journalism is currently making. • Header photo courtesy of user Martino's doodles' on Flickr. • Novelit graphic is courtesy of user Dave Heuts on Flickr. A Thinner Pen · Times, tribulations and observations about life. Also contains the online writing project, "novelit."